center verso in graphite: Abony, 1921.juli 19. The André and Elizabeth Kertész Foundation, New York, NY; gift to NGA, 1999. André Kertész, National Gallery of Art, Washington; Los Angeles County Museum of Art, Los Angeles; International Center of Photography, New York, 2005, no. 12. Foto: Modernity in Central Europe, 1918-1945, National Gallery of Art, Washington; Solomon R. Guggenheim Museum, New York; Milwaukee Art Museum, Milwaukee; Scottish National Gallery of Modern Art, Edinburgh, 2007 - 2008, no. 146. André Kertész, Galerie Nationale du Jeu de Paume, Paris; Fotomuseum Winterthur, Winterthur; Martin-Gropius-Bau, Berlin; Hungarian National Museum, Budapest, 2010 - 2011, unnumbered catalogue. André Kertész: Sixty Years of Photography, 1912-1972. New York, 1972: 23. 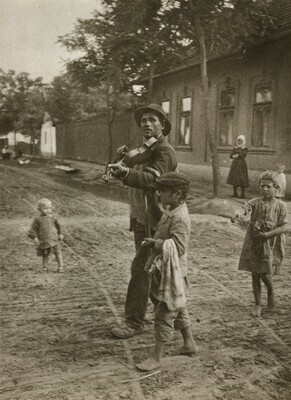 André Kertész: Magyarországon. Budapest, 1984: pl. 44. André Kertész: Diary of Light, 1912-1985. Millerton, New York, 1986: pl. 11. André Kertész: His Life and Work. Boston and New York, 1994: 79. In Focus: André Kertész, Photographs from The J. Paul Getty Museum. Malibu, California, 1994: pl. 7, p. 22. André Kertész. Exh. cat., Galerie Nationale du Jeu de Paume, Paris; Fotomuseum Winterthur, Winterthur; Martin-Gropius-Bau, Berlin; Hungarian National Museum, Budapest. Paris: Editions Hazan; New Haven: Yale University Press, 2010.